The installation focuses on bamboo as a building material. Bamboo is a special plant, which is grown for many reasons and has many different applications, including construction. Bamboo is very hard and elastic at the same time. Thanks to its elasticity, it can be easily shaped and is used, therefore, in the construction of buildings and for making furniture. In Nepal it is a local plant, so it can easily be used for construction in this area. However, despite its suitability, local constructers do not use the material much. Nevertheless, Czech architects decided to use the material for the main building of a school in Nepal, which is discussed in the context of the installation. The school also serves as a polyfunctional centre. The tool focuses mainly on the use of bamboo as a building material and also on the MELA project, which was an education project organized by the Czech NGO Namasté Nepál. The goal of the project was to build a school designed by Czech architects from an association called MEEM Architecture for Nepal. During the construction, they practically only used materials from the immediate vicinity of the construction area (e.g. stone, bamboo and reed). For the local people that is very important because it provides an opportunity for them to continue building with locally-sourced materials rather than being dependent on materials transported from other places. This project was a good example of international cooperation based on teamwork between the local community and the Czech architects, who designed the school to be built in a way requiring minimal technology by local workers using traditional materials. Click here for more information. A giant poster with information about the MELA project and information about the bamboo plant, its characteristics and uses. In its native region, the plant is known for its marvellous properties. It is flexible and stable at the same time. It grows very quickly and is an excellent building material. It can be found or grown in many places, including places where it is difficult to find other materials. A bamboo plant right next to the poster for visitors to see how it is growing. 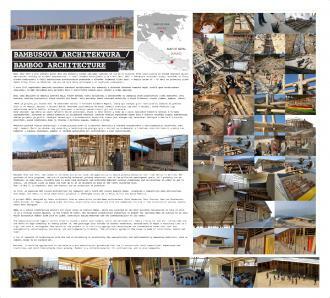 Photos and information about the school that MELA built in cooperation with local builders and Czech architects. After construction was completed, there was an earthquake in Nepal and the school together with the surrounding buildings were among the few that were not damaged. This strengthened local people’s trust in both the building material and the construction technology used. The poster also includes information about the earthquake in Nepal and its effect on the schools. Information about a collection brought by the NGO Namasté Nepál in cooperation with Czech Radio is also included. 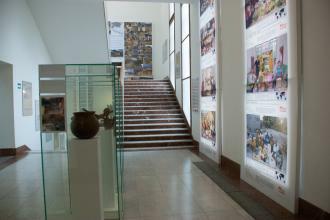 The poster and other tools were placed on a landing between the third and fourth floors of the museum, above the entrance to the room where the table with staple foods is located. The installation is connected to MDG 7 ("Ensure environmental sustainability") and MDG 8 ("Global partnership for development"). It supports environmental sustainability as it uses only materials grown in the construction area that do not have a negative impact on nature. At first we had to do some research on the topic of sustainable building materials and on construction projects in so-called developing countries. Then we started to look for projects that would suit our needs. After meeting several organizations involved in developing projects we found the MELA project, organized by Namasté Nepál and implemented by MEEM architects, which suited our needs. 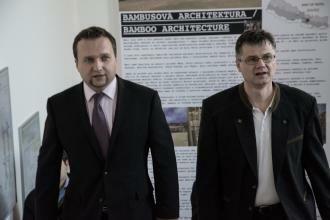 We contacted Nemasté Nepál and MEEM architects and discussed the possibility of collaborating on this installation. The architects and the project organizers were very cooperative and helped us with everything we needed. The process of gathering information and consulting with these partners took between two and three weeks. The third step was preparing the poster. We found an architect who is also a graphic designer, and well known for his contemporary architectural works and his exhibition designs. He produced the design and prepared it for printing. The poster is 4 x 3 m in size, of good quality and easy to read. The framing of the poster and the setting up of the installation was done together with other installations. It was done by a specialized company. Finally, we installed the poster together with the other tools comprising the installation. One positive was that, despite our fear that the installation was in a location where it could not be easily read, in the end we installed it in such a way that it could be read without any problems. We asked some of the visitors and they said that they had read it without any problems. The architects and the installation company accepted all requests to modify the installation, so it was a very open and comfortable cooperation with all the people we met from MELA as well as from the National Museum of Agriculture. During the preparatory phase, the museum asked us to move the installation to another place, which required us to modify the concept and composition of installation. Originally, we had wanted to place it next to an exhibition about trees, which complemented our topic. However, this exhibition was replaced by another with a topic much less relevant to our own and, in addition, we had to move our poster out of the way. Therefore, it is very important to seek clarity on the conditions in advance.